Sunday was the feast day of Mary's Assumption to Heaven. During mass yesterday, I was thinking about my lack of devotion to Mary. Don't get me wrong. I don't have anything against Mary. And it's not like the Catholic Church says you have to have a devotion to her. The church just teaches, to put it simply, that as the mother of Jesus she is a model for us and she can help us get closer to her son. I've seen people's response to her and how much they love her and how close they are to her. Personally, I've just never felt a need for that devotion. And then, yesterday, I had an, "AH-HA" moment. It's no secret that my spiritual life isn't where I want it to be. I'm always wanting to make it better. Which is a good think, I think. I think one of my stumbling blocks to God is accepting a Father's love. I grew up without a dad. The main fatherly image I had growing up was my grandfather. It was amazing but lets' fact it--when I was ten years old (which is how old my son is now) my grandfather was over seventy years old. So, I know how to give a "Father's love" but accepting it is another thing. It's different. So, I'm sitting in mass thinking, "Mary . . . Our Blessed Mother . . . wait a minute . . . Mary was a girl!!" This may not be a brilliant revelation for the rest of you and the fact that the Mother of God is a female wasn't really for me either. But since I never really had much of a masculine influence in my life, I have always had a special connection with women. Women have had more of an influence on me than men. I've always had more female friends than men. In fact, I was telling my wife about reconnecting with my best friend from high school a couple of months ago on Facebook. Her question was, "What's her name?" So, the church teaches us about Mary and about how she can be such a positive role model for us in growing closer to her son. I'm looking for a better relationship with Jesus. I connect better with women. Why WOULDN'T I use Mary to help me grow closer to Jesus?? I thought to myself, "What a brilliant idea!" And then I felt like an idiot because it took me so long to figure it out. It's not like the church doesn't put a special emphasis on Mary. She isn't some secret devotion. Heck, every time I go to confession, Msgr. Blacet tells me that when I'm faced with temptation I should ask for Mary's intercession. I've repeatedly been told she will help me. Sometimes I'm not as smart as I think I am. I am going to start going to Mary for help. I'm going to ask her to pray for me when I'm tempted. I even have a special intention that I'm going to lay at her feet for her assistance. I'm going to ask her to teach me more about Jesus and to pray for me that I may be pleasing to him. That way, as Msgr Blacet told me, when I get to Heaven I can tell Mary that it's her fault that I'm there. Those "AHA" moments are absolutely priceless and are never late. You rock. Msgr Blacet is such a wonderful man! I really love praying the rosary. I need to do it more often, but when I do it, I have a better prayer life over all. Bishop Finn gave a talk some years ago that I attended and he mentioned within that how Mary has shown us how to lay everything at the foot of the Cross and how she leads us right to the feet of her Son, our Lord, Jesus Christ. I am paraphrasing, of course, but that sentiment has stuck with me ever since. Our Priest on Sunday talked about how Mary was the perfect example of a Christian. She said 'yes' to God and never forgot that she said yes. She lived that 'yes' every day of our life. Coupled with what you've said here, I think I might be starting to understand why the Church puts such an emphasis on Mary. 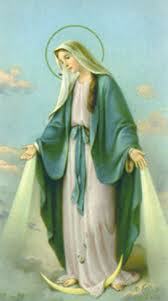 After attending mass last sunday, I began saying 3 hail marys every morning and meditating on the holy mother. What a different week this has been. I seem to have a new sense of peace and clarity. She is the most amazing example of what all of us mothers should try to be. I Need Me a Prayer Life!